LOS ANGELES – Focused, deliberate and energetic effort, the Thunder looked exactly what they are on Wednesday night against the Los Angeles Lakers: a top-tier NBA team. After an early back-and-forth with the Lakers in the first quarter, the Thunder exploded once the starters checked back in midway through the second period, as it finished off the final 8:09 of the half with a 28-9 run. That was all the separation the Thunder needed to continually extend the lead throughout the night, as Head Coach Billy Donovan’s club scored a season-high in a 133-96 victory. "Our defense was good, and then obviously when you move the ball and generate good looks, we shot the ball extremely well," Donovan said. 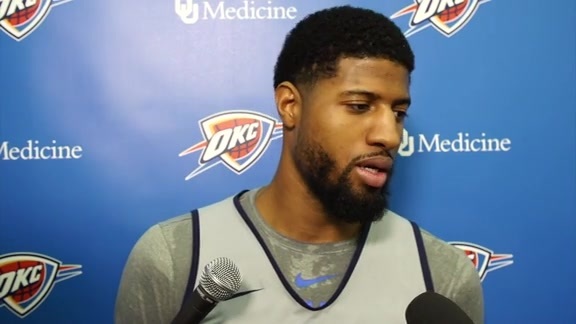 Los Angeles native Paul George served as the ignition switch for the Thunder’s blast off, knocking down a three-pointer, three free throws, a layup and then another three to cap a personal 11-point scoring run. Despite all sorts of noise that comes with playing the Lakers, and being back home, the only people in the crowd George acknowledged during the game were a pair sitting courtside – his mom and his dad. After knocking down that second three-pointer to get the Thunder’s burst started, George quickly skipped over to give his dad a hug and his mom a kiss on the cheek. Besides that sweet moment, it was all business for Oklahoma City to kickstart this road trip, as it should have been against the rebuilding Lakers. Behind the steady playmaking of Russell Westbrook, who found George coming off of curls, pin-downs and elevator screens, the Thunder’s offense operated at high gear. George finished with 24 points on 9-for-14 shooting, Carmelo Anthony had 21 on 8-for-14 shooting and Westbrook tied it all together with 12 assists to go with 20 points and 6 rebounds. Without Andre Roberson in the starting lineup, and coming off of a few subpar defensive showings, the Thunder knew it needed to bring tenacity to this one. While it blew some assignments early, the defense throughout the final 36 minutes of this one was back to the Thunder’s normal elite level. How bout a dozen Melo points in Q1? 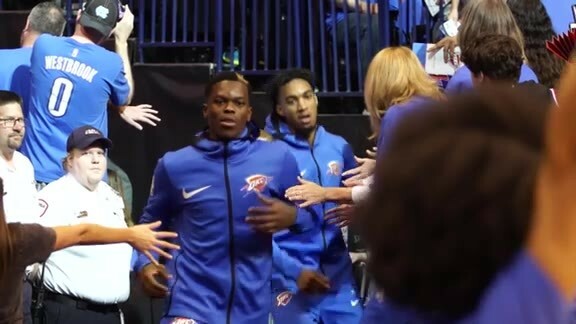 In Roberson’s place in the starting lineup was rookie guard Terrance Ferguson, who was a step slow in his first quarter minutes, but came out with his seemingly endless level of confidence and verve in the second half. For the game, he knocked down 6-of-9 three-pointers, tying a Thunder rookie record, on his way to 24 points in addition to being his normal pesky self on the defensive end. In the fourth quarter, Ferguson electrified the Staples Center crowd with two unbelievable fast break dunks, including a breakaway windmill slam that sent the Thunder bench into hysterics. Rookie breakout game. @the2kferguson scores 24. Six treys and a couple of these. U.S. Cellular highlight. Ferguson wasn’t the only role player to make an impact tonight. During the Thunder’s decisive second quarter, when it shot 66.7 percent and held Los Angeles to 31.8 percent shooting, Westbrook found both Steven Adams and Josh Huestis for easy dunks to keep the scoreboard moving. It was the Thunder’s defense during that stretch, where it at one point forced three straight turnovers that broke the game open and set a tone for the rest of the night. “We kept them out the paint,” George said. “We forced them to play in the half court. That was more our game." Late in the second quarter, Westbrook got blocked off by two defenders in transition, but after pulling the ball out with a hesitation dribble to the wing, he quickly crossed over baseline and left Kentavious Caldwell-Pope stuck in concrete. As the Staples Center crowed gasped, a flash of white and blue flashed through the air. It was Westbrook’s shoes, the Jordan Why Not Zer0.1’s that were unveiled by Westbrook and Jordan Brand on Wednesday. The shoes are Westbrook’s very first on-court signature shoe, a rare and prestigious tribute to his skill, tenacity and status in the NBA.